This comes a little late, but seeing how Zvon just released their latest expansion pack for Caustic, I thought I should give them a mention. Spread the word please... and don't be mad, I'm still working on Caustic. First of all: apologies, this post isn't about Caustic. I'm working to move things over to this website that will allow people to follow general news about my apps. Work on Caustic 2.0 is still progressing nicely in between holiday festivities and nasty illnesses but it's not ready yet. I hinted I was working on another app in between coding sessions for Caustic, and that app is out now so I just want to give it a shout here in case you're interested. Please help spread the word or your blogs, twitter, facebook, Google+, whatever the kids are into this week. The app is called LoopStack and it's a loop recorder for Android very similar to Everyday Looper on iOS, with a hint of Caustic's new UI and effects. 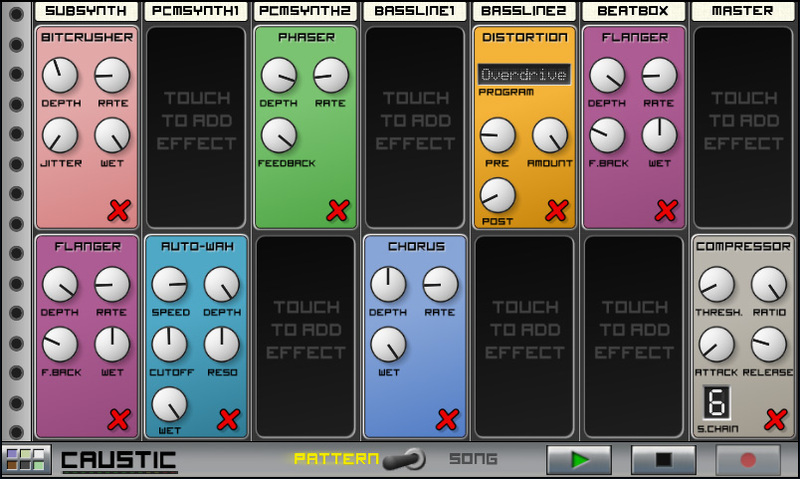 My plan is to bring some of this tech back into Caustic to allow sample recoding and maybe even a looper "machine". Read more about Spread the word please... and don't be mad, I'm still working on Caustic. Exciting news for Caustic owners and Android music makers. I've got a few week's work left polishing up version 2.0 of Caustic and it's HUGE. It would probably be shorter to list what's NOT new rather than the new features so for now I'll give you the major items with some screenshots. A more complete feature list, as well as a user's manual, will accompany the official release. I've spent a bit of time "tightening up the graphics" on Caustic using the excellent SkinMan and KnobMan programs. The result is an app that takes itself a little more seriously compared to the programmer art I had in version 1.0. This should also allow for new skins to be created in the future. You can now put whatever 6 machines you like in your rack. You want a crazy acid rig with 5 BassLines and a BeatBox, go for it. Nothing but SubSynths? Sure! Some machines are harder on the processor than others, but I've optimized everything to handle the average song on most devices. This also opens up the possibility of adding new machines to Caustic, which has me excited. I've already got a few prototype machines showing a lot of promise. 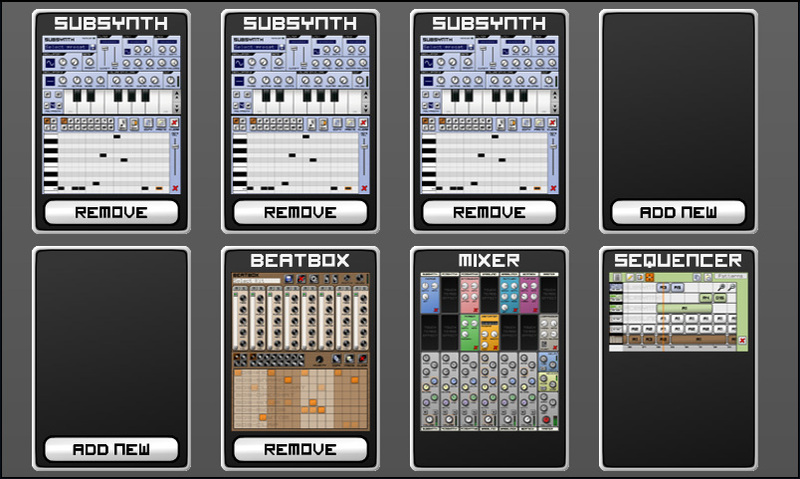 The SubSynth and PCMSynth now have pattern editors too. 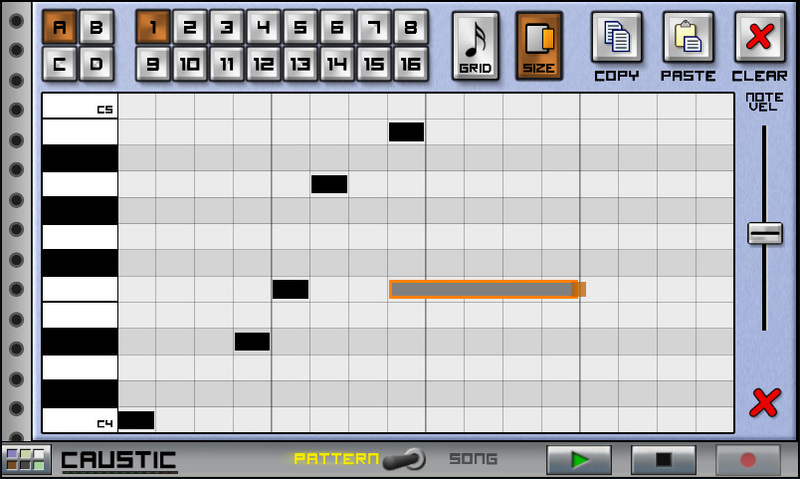 You can create entire orchestrations in pattern mode now, then drop them into the sequencer's single-page "pattern view". The sequencer still has full-song piano roll for things that don't suit patterns. I know the sequencer is a major sore spot for the app right now and I think the new pattern editors will help take away some of the pain while I continue improving the workflow. 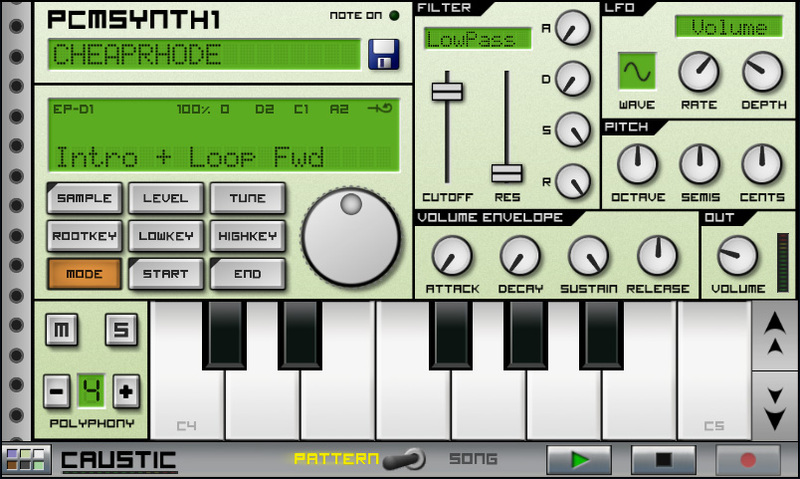 The PCMSynth extends to a full screen's worth of features. It's literally half sampler, half synth. Load up a simple WAV file or load a complex multi-sample instrument with loop points and send that all through the Filter, LFO and envelopes. The PCMSynth can now also load straight from SoundFont files (.sf2). Don't get carried away and load your 600Mb pro grand piano set, there's lots of older sf2 files on the net that make good mobile app instruments. I'll include some nice small ones with this release. The BeatBox got some love too. 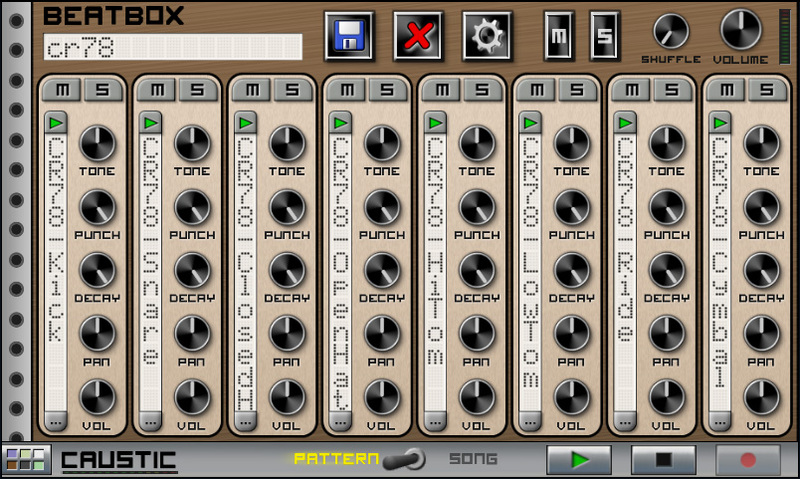 It gets a entire new top half, exposing lots of controls you'd find in a typical drum machine. You'll get: Tone, Punch(attack), Decay, Volume as well as Pan adjustments per-instrument. The BeatBox is the only machine with stereo output for now, but it might be going into others later on. There's always something, but this is minor. With each machine having its own pattern editor and a new effects section, there's a lot more scrolling to be done. The "machine jump" screen, which now also serves as the dynamic rack management screen, is going to be used a lot. Because some devices don't have a search button, this popup is now also mapped to a quick button in the bottom bar. I know some will get annoyed at all this scrolling, but I think the added features make it worthwhile. The other news is the price of the full version is going up to ~8$. I've spent the better half of the last three months working like crazy to add major features and improve the app. Without revealing exact sales figures, let's just say I'm doing this for passion more than profit right now and that has to change a bit if I'm to keep going with updates. What does this mean to you? For those who've already bought the app, thank you very much for your support so far, you'll be getting this upgrade like any other for free when it comes out. If you haven't bought yet and were waiting for the app to mature, take a chance and buy it soon for cheap or wait and pay a bit more. I have no doubt the new version will be well worth the asking price. I'm really hoping to have this out for the holidays but there's still a bit of work to do and I really don't want to publish until it's solid so please be patient, it'll be worth it.